Tempur-Pedic Celebrates 25th Anniversary with Debut of Limited-Edition TEMPUR-Legacy™ Mattress | Tempur Sealy International, Inc.
LAS VEGAS, Jan. 20, 2017 /PRNewswire/ -- To celebrate 25 transformative years in sleep innovation, Tempur-Pedic announced today the introduction of the new, limited-edition TEMPUR-Legacy™ mattress, which combines one-of-a-kind, pressure-relieving TEMPUR® material with a soft feel. Decades after a pressure-relieving material was developed to cushion astronauts during takeoff and touchdown, TEMPUR material now delivers life-changing sleep to millions around the world. "Tempur-Pedic is proud to unveil a limited-edition mattress to celebrate a distinguished 25-year legacy of delivering life-changing sleep," said Scott Thompson, Chairman, President and Chief Executive Officer of Tempur Sealy. "Tempur-Pedic continues to transform the category - continuously innovating the next generation of sleep-enhancing products to ensure we're helping consumers get the rest they need." The feel of the new TEMPUR-Legacy mattress is unlike any other Tempur-Pedic bed, featuring a soft feel thanks to the TEMPUR-ES® material on the top comfort layer. One layer deeper, TEMPUR material in the support layer delivers more of the category-leading product benefits that are expected from Tempur-Pedic beds. For a quarter century, the brand has been known for reduced motion transfer, personalized comfort and support and more pressure relief, as well as the ability to adapt to an individual's temperature, weight and shape. The TEMPUR-Legacy bed also features a unique cover design and sleek aesthetic with subtle silver accents - paying homage to the traditional "silver" 25th anniversary gift. 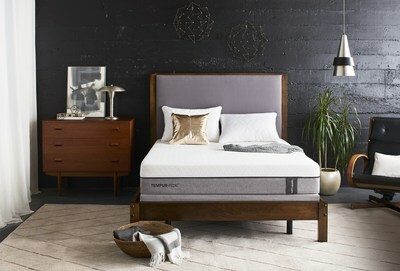 Beginning this spring, a TEMPUR-Legacy queen set will be available for $2,499 at Tempur-Pedic retailers and online at www.TempurPedic.com. In early 2017, Tempur-Pedic will kick off new simplified pricing and product portfolio. The moves are designed to align Tempur-Pedic's mattress collections at regular price intervals and help consumers find the right mattress easier. "At Tempur-Pedic, we are consumer-centric in our approach to our business," Thompson added. "Consumers are looking for a simplified experience in the category and this new product portfolio and pricing structure will simplify the journey with the Tempur-Pedic brand." Twenty-five years ago Tempur-Pedic transformed the mattress category, introducing a new kind of sleep that was deeply refreshing and truly transformative. The architect of that vision was Robert "Bobby" Trussell, Tempur-Pedic company founder and first CEO. Now a member of the Board of Directors for Tempur Sealy International, Trussell's way of thinking has been a guiding force every step of the way. In the late 1960s, NASA aircraft engineers developed pressure-relieving material to cushion astronauts during takeoff and touchdown. Twenty years later, Swedish scientists built on that transformative technology and perfected the material for sleepers, dubbing it "TEMPUR material." Tracings its roots to the early years of space travel, TEMPUR material was eventually inducted into the Space Technology Hall of Fame. Its energy-absorbing properties gave sleepers personalized comfort and support, pressure relief and motion separation, unlike any other mattress on the market. In 1992, Trussell had the vision to bring TEMPUR material to sleepers in the U.S. for the first time. The company started with just two products - a 3-inch topper and the iconic "Swedish neck pillow." In that first year, just 70 toppers were sold. That was just the beginning. Today, Tempur-Pedic sells more than 500,000 mattresses each year, with more than 6 million satisfied owners in 70 countries. Still a trade secret, TEMPUR material is made only in company-owned manufacturing plants using Tempur-Pedic's proprietary formula and manufacturing process. The brand's rigorous quality assurance measures ensure delivery of a consistent product, day after day, to consumers all over the world. "From day one, we were focused on the delivery of exceptional sleep," Trussell said. "That mindset is instilled within this company and I see it in every Tempur-Pedic bed. While the look of the beds has changed over the years, it's the TEMPUR material that always delivers." 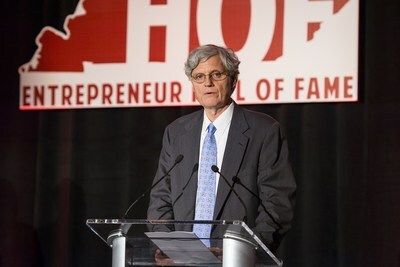 Recently, Trussell was inducted into the Kentucky Entrepreneur Hall of Fame. The Hall honors Kentucky's most successful entrepreneurs and only four recipients were chosen for the 2016 class. "It's amazing to see Tempur-Pedic take off and become a leader, but more so to see how millions of people have benefited from the technology," Trussell said. "Over the years, in talking to many of our customers, it's easy to see how TEMPUR-Adapt™ technology has helped them get more restful sleep and feel better each morning. Being a part of that has been an honor and privilege for me." Tempur Sealy International, Inc. (NYSE: TPX) is the world's largest bedding provider. Tempur Sealy International, Inc. develops, manufactures and markets mattresses, foundations, pillows and other products. The Company's brand portfolio includes many highly recognized brands, including TEMPUR®, Tempur-Pedic®, Sealy®, Sealy Posturepedic® and Stearns & Foster®. World headquarters for Tempur Sealy International, Inc. is in Lexington, KY. For more information, visit http://www.tempursealy.com or call 800-805-3635.